The Silcon System project is mainly a database containing links to free music, with the website I want to give people access to stuff that I've collected over the years since it is always available somewhere on the net I can point towards it and people can download it if they like. Users can also add their own music to the database so new talents can use the site for promotion or share their favourite music with others. 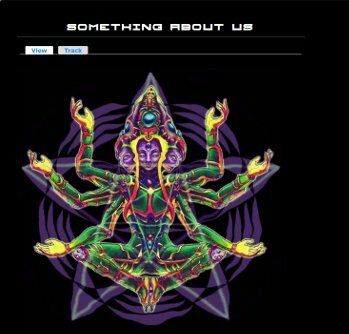 In the Silcon System Databases you'll find all kinds of Psychedelic music, we focus mainly on Psy-Trance and Goa from back in the day but You'll find bands and experimental stuff too, and because users can add their own music the Databases will slowly grow and more categories will be added. Here we will keep looking for music and new sharing servers all the time so empty it will never be anyhow. Here at LucidVision its all about the looks of things, I love Psychedelic artwork and there's just so much of it, We'll browse for it and add some galleries to the site aswell, We'd also like to be a platform where artist can share their works and that could be anything from digital arts to party decorations. But this can only work if the users are going to use these features so for now there's mainly focus on the music databases. 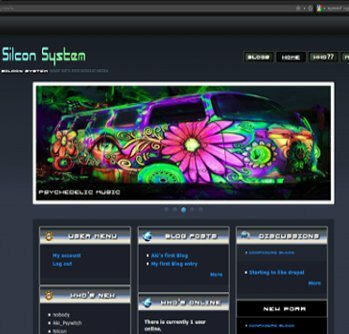 Because Silcon System is based on Drupal we got a lot of forum and blogging functionality already built in. 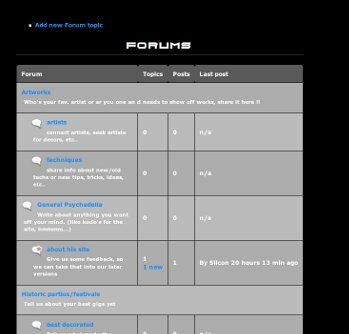 I've added lots of forum topics but to really fill it till it bursts it up to the users, and that means you, and you, and you, and you aswell... We hope to create a Community website and Social Media is implemented in the website, at the moment it is not possible to log in with a Facebook or Twitter account but it will be in near future.